I suspect most any modeler who has been at it for a while decides to take on a challenge to do something a bit off the beaten track. 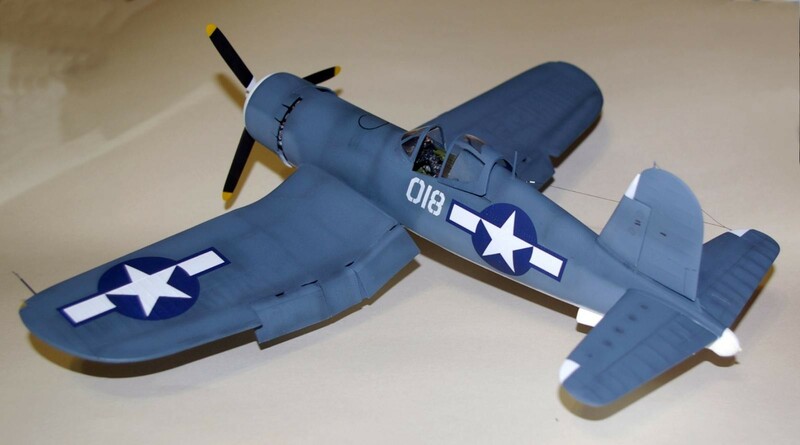 I’ve always been attracted to the F4U Corsair and have lost track of how many of them I’ve built over the years. 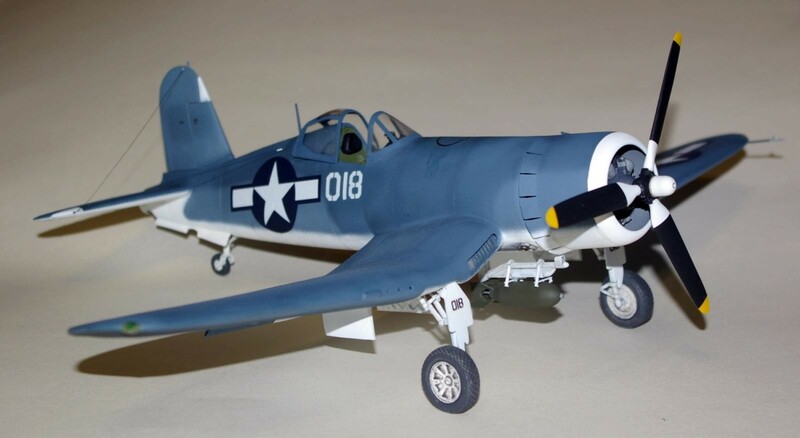 Back in the late 60’s when Revell released their 1/32nd F4U-1A I was absolutely delighted and build several of them and even more as the years went by. Actually for its time it was a pretty good kit. But as time passed and the state of the modeling art progressed it became obvious to me that the Revell offering was pretty much spartan with little interior detailing. Still, the exterior was very much a Corsair. So, recently I decided to see what I could do with that kit using it as the basis for a build and incorporating some of the available after-market parts currently available. The finished model seen in the pictures below is the result of my efforts to produce a respectable Corsair from that kit. 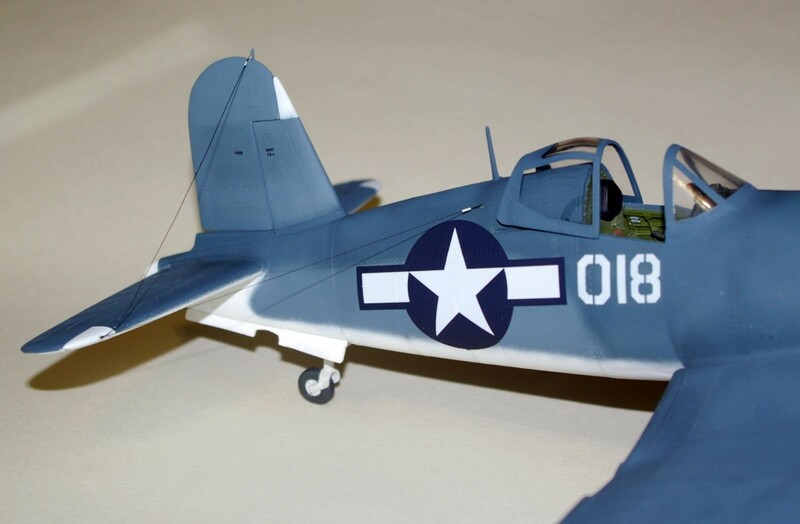 The finished model represents an FG-1A from VMF-114 as seen on Peleliu in October of 1944. The build was accomplished using the Lone Star resin wheel wells (which required some very tedious trimming to make a proper fit) and Mike’s wheel and tire set and tail wheel doors. The cockpit interior was from True Details. I used the resin prop offered by Two Mikes. 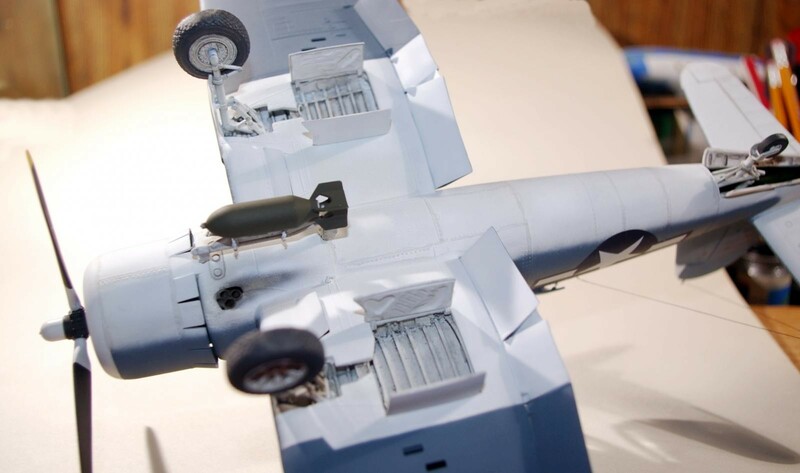 I ‘pirated’ the engine and flaps and main wheel well doors from the Trumpeter F4U-1D kit and the Brewster bomb rack and 500-lb bomb from the Tamiya F4U-1A. The decals consisted of the National Insignia’s from the Fundekals sheet which are among the finest decals I’ve ever worked with and I highly recommend their decal sets. The white numbers were from ye ole decal stash box. The black lettering decals on the front landing gear doors and tail were done for me by a fine modeler and most generous helpful person, Pip Moss. The model is airbrushed with Model Master enamel paints. The final photo in the pictures below is the actual aircraft I was modeling. I realize my model doesn’t reflect the degree of weathering seen on the real plane. Frankly weathering a model is a skill I have yet to acquire without botching it up so I opted to leave it in a pretty clean condition. Note that the antenna arrangement is different from what is normally seen on that version Corsair but the Corsairs from VMF-114 were rigged that way, at least from the time period that photo was taken. Any comments and/or questions are welcome. Thanks Craig….I spend my ‘hobby’ time split between building models and scanning military aircraft photos/negs/slides for my files. Those two pursuits share some commonality as I often model an aircraft from a photo that catches my eye. Nicely done Jim , looks like you took an old modeling bird and produced something rather special. BTY the Corsair they’re rebuilding at the Cincinnati WarBird Museum is progressing slowly but surely. And they plan on painting her to represent Col Glenn’s Corsair that he flew with the Naval Reserve out of Columbus, Ohio. Thanks for your comments Tom and I appreciate the update info on the Corsair restoration at the Cincinnati Air Museum. F4U is my all time favorite too………… Thanks for sharing this with us. Thanks Louis, you just can’t have too many Corsairs. Jim, you nailed it ! Absolutely beautiful, my friend. Thanks to you I have developed a new-found respect and yes, love of the Bent-Winged Bird. I always have admired it but after “meeting” you last year I gave the F4U a number of closer looks. Back when he was still with us, I asked Dad if he ever flew one and he said he’d taxied several around for various maintenance reasons, but he never got to fly one. This is certainly one of the finest models I’ve seen. Bravo! That white front of the cowling with the base of each prop painted is a new and very interesting variation I’ve never seen before. Very different and attractive ! Thank you Jeff and there are many, many fine marking options for WWII Corsairs. Hopefully we’ll see more decal offerings in the future to make marking those Corsair builds a bit easier. Excellent work Jim. All of your added detail work rivals anything Tamiya could do! The paintwork is top notch too my friend. Two thumbs up…and more if I had ’em. Thank you for your comments Clark. I guess in a way I was just warming up for that Tamiya F4U-1A build. That really is an awesome kit and a bit intimidating when you first open the box. Yes! One excellent Corsair, great detail work.! I remember when Revell introduced this kit, never built it, but for awhile it was latest and greatest. 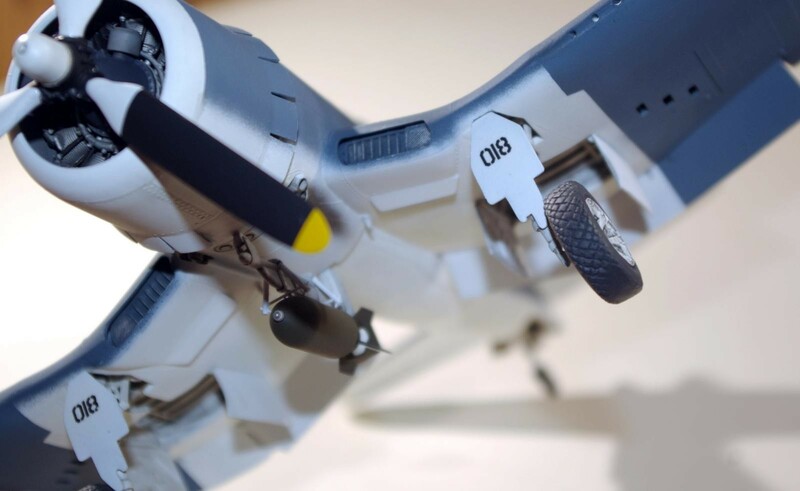 Thank you Robert and if you want a large scale Corsair, that old Revell kit is a great place to start either out of the box or with some after-market parts. Jim, nicely done (I like the look with the white cowl ring !) The different shades in your paint look great. I like it A lot. You mention that you liked the Fundekals, and I’d like to 2nd that. These are a fabulous decals in quility and color. Highly recommended. Thanks Terry and I suspect we are not alone in endorsing Fundekal sheets. Even with the rather large rivet pattern on the fuselage of that Revell Corsair, those decals snuggled down pretty much like they were painted on. 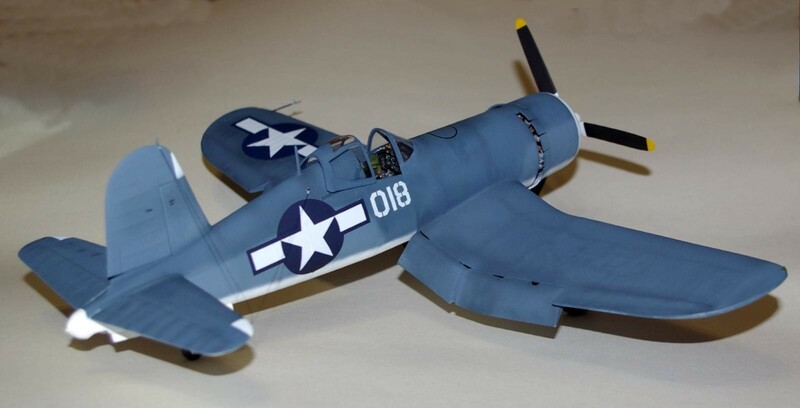 Having finished a Corsair in the last couple of months I have new appreciation to anyone who builds a good one. I love that it’s unique and not run-of-the-mill decals. Great job on the finishing. Seeing a clean one is rare & nice to see. Jim, sticking a Corsair on this site is like sticking a stripper on a submarine. I agree with Matt, it’s unusual and refreshing to see a ‘clean’ example. The Corsair, not the stripper. Great build with lovely variations in the blue. I really like this. Sorry – silliness runs rampant in my family! HA! Jim’s Corsair IS beautiful, isn’t it!! Jeff, Jeff, Jeff. In my limited experience of strippers, finding clean ones are like sensible Tankers; possible to find but they’ve usually stopped doing it for a living. And in terms of silliness, it suits you, Jeff – don’t do anything different! Thanks David…I think I’ll leave the rest of that conversation alone. David; “Sensible Tankers” ?? maybe … but some would say that’s an oxymoron. Not me, of course. 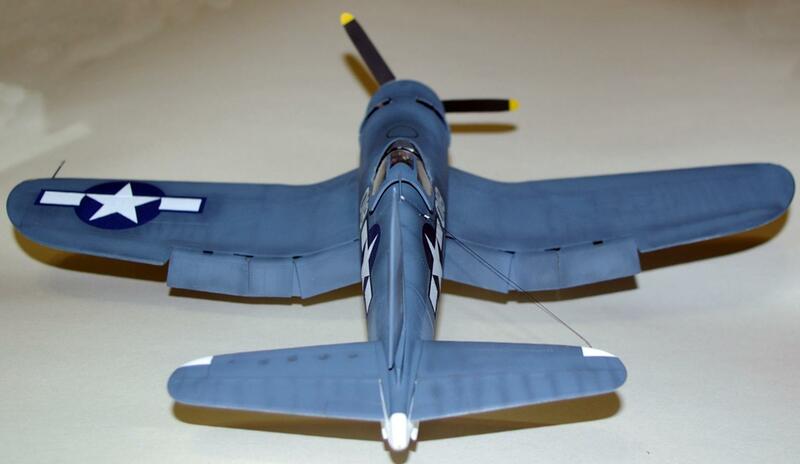 Now, back to the star of this “show” – Jim’s fabulous F4U ! Yep, she is a beaut. 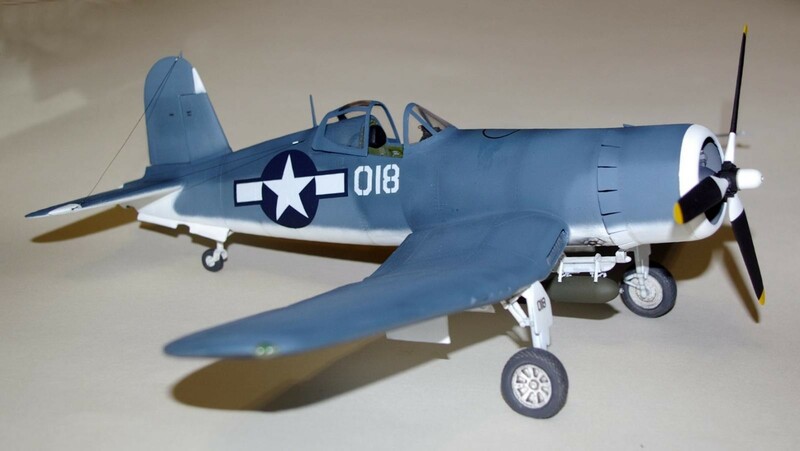 Another great Corsair and I love that u made a different version then most. U captured the color scheme really well. 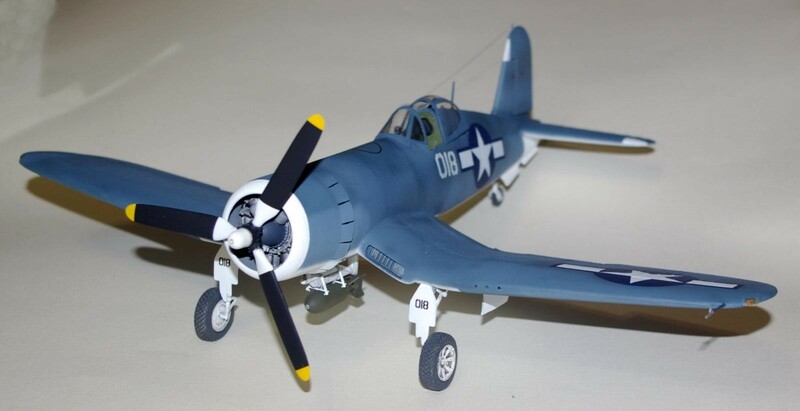 I myself just finished the Tamiya F4U-1A and can’t wait to do another but waiting for a 4 bladed variant Tamiya release. Thank you Paul and I too anxiously await a Tamiya 1/32nd F4U-4. I truly hope that will become a reality as I think they’d sell a large quantity of them. Much respect for tackling one of the oldies. I like to do the same. Looks great. Thanks Mark and I agree that some of those ‘oldies’ are well worth the time to model. With all the after-market goodies now available it often makes working with those old kits a bit easier. Jim , Outstanding work , I like the paint work , great job my friend. Thank you Kelly, I’ve always been pleased with the Model Master enamel paints. That’s a lovely model, Jim. I am so glad you got to go back to one of your favourite older kits and add and change to improve it. You have done a magnificent job! Your airbrushing and finishing is also something we could all aspire to – really impressive! Thank you Paul. I’ve always been fond of that tri-color paint scheme on a Corsair. There’s a lot to be said about the GSB finish too. I appreciate your comments and thank you again. A beautiful looking Corsair, I really like the finish you’ve achieved on it. Hi Jim. Your Corsair is truly a work of art. The passion you have for the bent wing bird is evident in the final result of this beauty. A beautiful paint finish just adds to the appeal of the finished product. Well done!! Good to see the old girl get an update. Revells 32nds were a revelation when they appeared. A lot of us cut our modeling teeth on them, so they deserve to be remembered and built. Particularly given Revells current situation. The old order changes. But we remember.